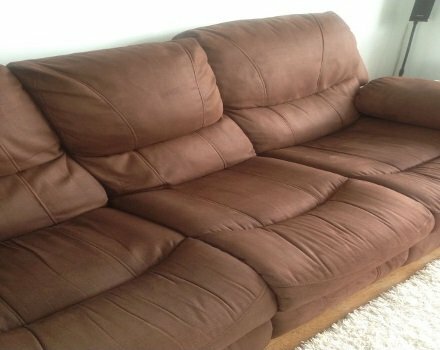 How do you clean a suede sofa or armchair? Suede is a beautiful and luxuriously soft upholstery material for sofas and armchairs, but it does have a bit of a reputation for being difficult to maintain. That said, cleaning and removing stains from suede doesn’t have to be a big drama if you follow our advice below. If your suede sofa or armchair is just a bit grubby, it’s quite straightforward to freshen them up. Simply wipe the surface with a damp cloth to remove surface dirt and dust but without getting the material wet. This should be a regular part of your home cleaning routine. Professional upholstery cleaners will never use water, shampooing or steam cleaning methods to clean water sensitive materials such as suede. Instead, there are specialist dry cleaning procedures that will get the job done safely and efficiently. Make sure you use a specialist cleaning product designed for suede. Before you use ANY product, though, test it on an inconspicuous area for 20 minutes or so to check that it won’t cause any damage. Once you’re certain the product is safe to use, follow the product manufacturer’s instructions. If you don’t have a specialist suede cleaner, you can use white distilled vinegar diluted in water as a great alternative. Again, you should test it on a hidden area first. Whatever suede cleaning product you use, make sure you always blot the area dry after the stain has been removed. Suede is particularly sensitive to moisture, and liquid can cause real damage to the gorgeous material. If you’ve spilled food or drinks onto your suede armchair or sofa, you need to act fast. Gently blot the spot to soak up as much of the stain and moisture as you can. You can also use a slightly damp cloth to blot any residue. If necessary, apply a stain treatment immediately and according to the manufacturer’s instructions, leave for a few minutes and rinse the area with a clean, damp cloth. You can use a hair dryer to help dry the area. The best way to remove an old stain is to use a rubber eraser or suede cleaning block and rub the area gently. Once the stain has gone, use a soft brush to remove the excess dirt from the area. Some stains will be hard to shift – ink or crayon, for instance. 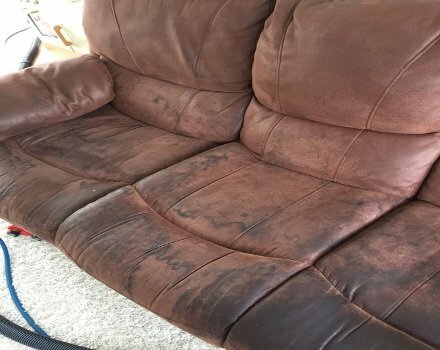 If that’s the case for your suede sofa or upholstery, you are advised to contact a professional leather cleaning company to deal with tricky stains. Regular gentle brushing is an excellent way to keep your suede looking immaculate – and a ‘must do’ if you have a cat or a dog. For stain removal, once you’ve cleaned up any spills and got rid of any marks, wait for the area to dry completely, then give it a brush with a soft suede brush. Use gentle circular brush movements, applying a little more pressure on the relevant area that’s just been treated.